I couldn’t resist sending this. She is just a little treasure. She has so much personality . I adore her. She is house trained. She takes herself outside and even at night she waits until the morning when I take her out. I imagine there will be a few accidents but she is very intelligent. It is almost a year since I picked Zoe up from you at Katoomba. I just wanted to share this photo with you. 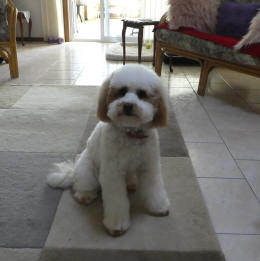 It is taken just after a bath and groom. She is the most lovable and affectionate little girl and has made herself loved by all the family. She is absolutely adorable, and has a great personality. At the moment she is snuggled up on the lounge ( the one with the red towel on it) and into the cushion . Thoroughly spoilt! She loves being inside but also loves chasing lizards outside. Fortunately they are too fast for her, but they keep her amused for hours. Hope you have had a good year.